It feels as though it's been a while since I had some big deliveries. 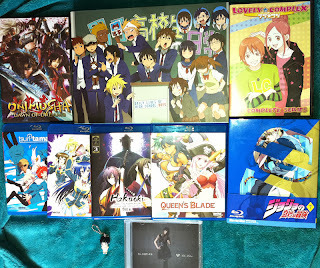 A batch of US anime came in today, as well as the replacement for a Yesasia shipment which went missing in the post. The picture is even worse than usual thanks to the overcast weather providing little natural light. 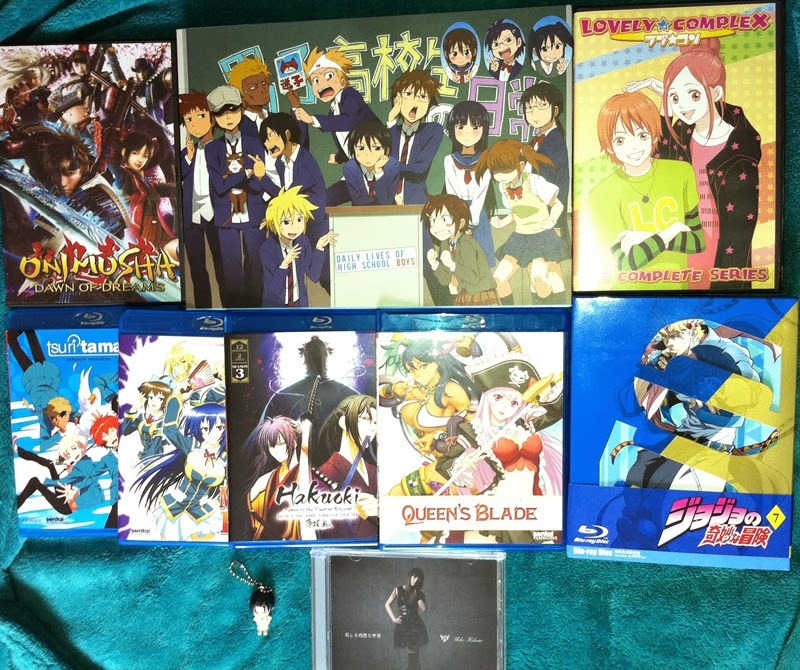 From the US, I received Lovely Complex (Love☆Com) and Onimusha: Dawn Of Dreams on DVD, as well as Tsuritama, Medaka Box season one, Queen's Blade Rebellion, Hakuouki Reimeiroku and Daily Lives Of High School Boys (Danshi Koukousei No Nichijou) on Blu-ray. From Yesasia, the seventh JoJo's Bizarre Adventure special edition Blu-ray arrived along with the first Attack On Titan (Shingeki No Kyojin) ending, Hikasa Youko's beautiful Utsukushiki Zankoku Na Sekai. A freebie Takao keychain charm accompanied the order to get me in the mood for the upcoming season season of Kuroko No Basuke. The lack of UK streaming announcements for this Autumn's anime season has been a huge disappointment to me over the last week so I'll probably be enjoying these discs sooner than planned. It seems that my money isn't good enough for the anime industry anymore.